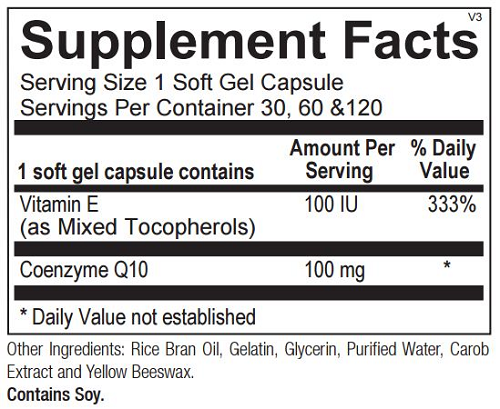 1 or more soft gel capsules per day or as recommended by your health care professional. Coenzyme Q10 (CoQ10), also known as ubiquinone, is a proenzyme produced naturally within the body. 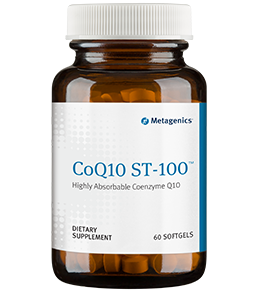 CoQ10 plays a critical role in energy (ATP) production and is one of the most powerful known lipidsoluble antioxidants, protecting cells, organs and tissues from damage caused by oxidative stress and free radicals. CoQ10 inhibits protein and lipid oxidation and protects mitochondrial DNA from oxidative damage. This CoQ10 formulation is delivered in an oilbased proprietary form and includes natural vitamin E for enhanced absorption and maximum stability. 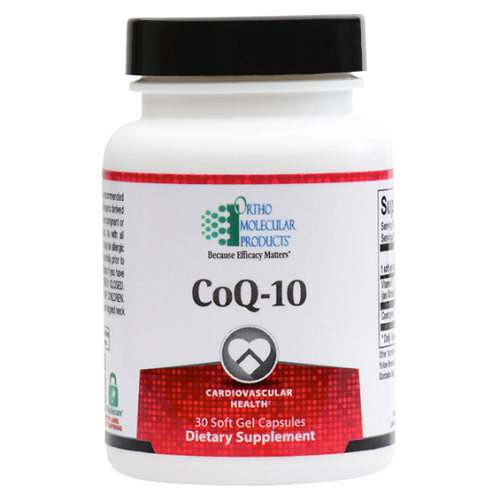 CoQ10 is a lipid-soluble antioxidant found in every cell in the body. CoQ10 is abundant in the mitochondrial membrane and plays an important role in the synthesis of adenosine triphosphate (ATP), a molecule of chemical energy upon which all cellular functions depend. The synthesis of ATP within the mitochondria is a multi-step series of biochemical reactions called the electron transport chain. As a coenzyme, CoQ10 is required for several enzymatic reactions required to produce cellular energy and to protect the body against free radicals produced during this process. To maintain energy production, mitochondrial CoQ10 is continuously recycled from ubiquinone, its ATP production state, to ubiquinol, its antioxidant state. After the age of 35 to 40 years, endogenous synthesis of CoQ10 begins to decline.1 CoQ10, an essential component of cellular energy production, has been shown to extend cell life and benefit high-energy systems, namely the cardiovascular, neurological and immune systems. The body’s ability to produce and metabolize CoQ10 has been reported to decrease with age. CoQ10 deficiency may be caused by insufficient dietary intake of CoQ10, impairment in CoQ10 production, drug-induced CoQ10 depletion, gene mutations and oxidative stress. HMG-CoA reductase is an enzyme required for the synthesis of cholesterol and CoQ10. Cholesterol lowering medications inhibit this enzyme in order to reduce cholesterol synthesis, but may also simultaneously deplete CoQ10 status. 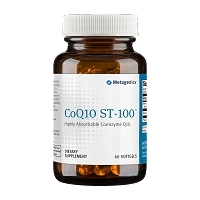 Thirteen controlled studies conducted between 1990-2004 demonstrated significant CoQ10 depletion, secondary to use of statin medications used to lower cholesterol levels.2 These studies demonstrated a range of 19- 54% decrease in CoQ10 levels in patients on statin therapy. In the event of CoQ10 depletion, supplementation can improve CoQ10 status and help maintain optimal levels in the body. Antioxidant Protection† Oxidative stress is a condition that occurs when there is an imbalance between free radicals and the antioxidants required to neutralize them, leading to oxidative damage in the body. The extent of oxidative stress depends on the rate of free radical generation, the level of antioxidant reserves and the rate of repair of cellular and tissue damage. This process has a significant impact on the body’s aging process. In its role in electron transport, CoQ10 continuously goes through an oxidation-reduction cycle in order to neutralize free radicals and provide significant protection against toxic oxidative reactions in the body. 1. Hojerova J. Coenzyme Q10- its importance, properties and use in nutrition and cosmetics. Ceska Slov Farm 2000;49:199-123: [Slovak]. 2. Hargreaves IP, Duncan AJ, Heales SJ, Land JM. The effect of HMG-CoA reductase inhibitors on coenzyme Q10: possible biochemical/clinical implications. Drug Saf 2005;28:659-676. 3. Langsjoen PH, Vadhanavikit S, Folkers K. Effective treatment with coenzyme Q10 of patients with chronic myocardial disease. Drugs Explt Clin Res 1985;11:577-579. 4. Langsjoen P, Langsjoen P, Willis R, Folkers K. Treatment of essential hypertension with Coenzyme Q10. Molec Aspects Med 1994;15(Suppl):S265-S272. 5. Stocker R, Bowry VW, Frei B. Ubiquinol-10 protects human low density lipoprotein more efficiently against lipid peroxidation than does alpha-tocopherol. Proc Natl Acad Sci 1991; 88(5):1646-50. 6. Gaby AR. The role of coenzyme q10 in clinical medicine: Part II. Cardiovascular disease, hypertension, diabetes mellitus and infertility. Altern Med Review 1996; 1(3):168- 175. 7. Shigeta Y, Izumi K. Abe H. Effect of coenzyme Q7 treatment on blood sugar and ketone bodies of diabetics. J Vitaminol 1966;12:293-298. 8. Mancuso M, Orsucci D, Calsolaro V, Choub A, Siciliano G. Coenzyme Q10 and Neurological Diseases. Pharmaceuticals 2009; 2:134-149.